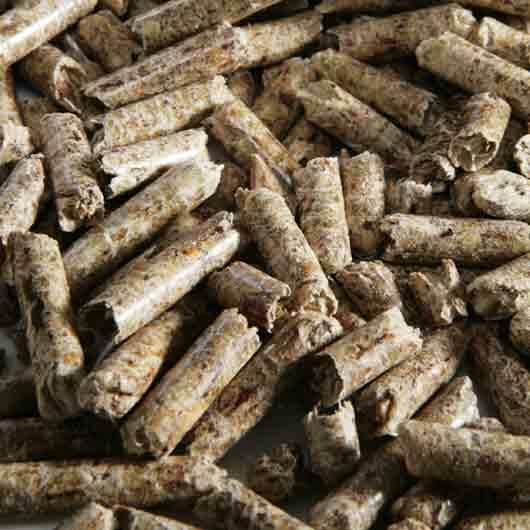 Wood pellets are a renewable source of fuel. As long as the wood is sourced from a working forest (ie one where more trees are planted to replace trees cut down) then the wood is renewable. To get more wood you simply grow more trees. When the tree grew it used energy from the sun to convert CO2 from the atmosphere into wood, letting it grow. When the wood is burnt the carbon dioxide emitted is this same CO2 that had been taken out of the atmosphere by the growing plant. So that means that overall there is no change in the levels of atmospheric CO2. If the tree were left to die naturally then animals and plants would 'eat' it eventually releasing the same amount of CO2 back into the atmosphere. Burning the wood just speeds up the process. Even allowing for carbon dioxide emissions produced by fossil fuels used to make the energy needed for planting, harvesting, processing and transporting the fuel, replacing fossil fuel with wood fuel will typically reduce net CO2 emissions by over 90%. Are wood pellets carbon neutral? Wood and wood pellets are not carbon neutral. This is because it takes some energy to plant, harvest, process and transport the pellets, and this energy is usually derived from fossil fuels. The manufacturing of wood pellets takes a relatively high amount of energy, especially when compared to wood chips. If the whole process were powered by carbon neutral energy sources then wood pellets would be carbon neutral. Compared to other fossil fuels wood pellets (and wood) still result in MUCH less CO2 production.